Evelyn Carr has been named as a George London Foundation Scholarship Winner. The George London Foundation for Singers is a New York-based non-profit organization that supports young artists with their training and early in their careers. George London was one of the great singers of the 20th century. He performed at the Metropolitan Opera and venues around the world. He served as the Artistic Director of the John F. Kennedy Center for the Performing Arts, Director of the National Opera Institute and Washington Opera. The George London Foundation awards program serves as a "living legacy to George London's talent and generosity, " as stated on the organization's website. Miss Carr is a Vocal Performance Major in the Manhattan School of Music Pre-College program. 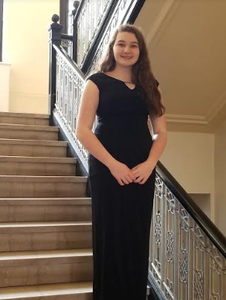 She has won First Place in the Forte International Music Competition at Carnegie Hall, and First Place in the NY Lyric Opera Vocal Competition. Locally she has performed with the Danbury Music Centre and on a recording with the Ridgefield Symphony Orchestra. She also sings at her church and is the "Official Singer" for American Legion Post 78.